Recognizing systematic integration of sustainability and LEED standards. The Happy Meadows Courtyard House, a thoroughly sustainable Modern residence designed by Chapel Hill architect Arielle Condoret Schechter, AIA is a finalist for the 2014 Green Gala Sustainable Business Awards in the Residential category. 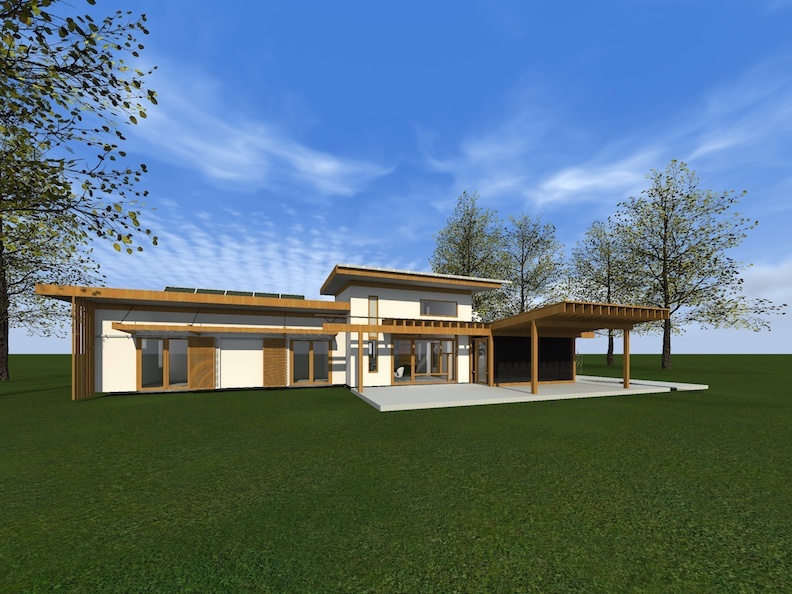 The US Green Building Council / North Carolina chapter selects and presents the annual awards. The Sustainable Business Awards recognize the best designed or built projects that demonstrate the systematic integration of sustainability and LEED standards. Built by Chapel Hill Contractor Kevin Murphy of NewPhire Building for Phil and Velma Helfaer, the 2567-square-foot Chatham County residence is located on a five-acre property and built at the highest point of the site, leaving the existing large meadow and remainder of the site, including mature trees, undisturbed. Architect Schechter, an animal advocate, included a wildlife pond as part of the design concept. All main rooms in the house face south for passive solar gain and deep roof overhangs shade the interior all summer yet lets the sun penetrate all the way inside in the winter. The house maintains an intimate relationship with the outdoors via a large south-facing terrace, a small interior courtyard, and glass exterior doors in all main rooms. Other sustainable features are: operable windows for cross ventilation and to take advantage of the prevailing breezes; abundant daylight so that electric lights (all LED) should not be needed by day; thick 5500 psi prefabricated concrete exterior walls that incorporate reclaimed fly-ash and help the interior stay cool in the summer; no-VOC finishes and Air Renew Essential sheetrock that converts any VOC within it into an inert compound; 100% rainwater capture from the white EPDM “cool roof” that allows for the cleanest rainwater capture; 5.4KW photovoltaic array, which will produce 98% of the house’s energy; a Conditioning Energy Recovery Ventilator that pre-dehumidifies incoming fresh air in summer; and the use of scrap materials for many interior finishes. Still under construction, Happy Meadows has already been certified to PHIUS PLUS (Passive House Institute US) standards, one of the strictest building sustainability standards in the world. It has also achieved NET-Zero, meaning that the house produces all of the energy it used. Happy Meadows is projected to be LEED Platinum. The 2014 winners will be announced during the Green Gala, which will be held at the LEED Gold Ritz-Carlton hotel in Uptown Charlotte on Friday, September 26. For more information on all categories in the 2014 the Sustainable Business Awards, go to http://www.usgbcnc.org/?page=PacketRequest. Arielle Condoret Schechter, AIA, is a licensed, registered architect based in Chapel Hill, NC, who specializes in Modernist, energy-efficient buildings of all types and sizes, especially houses. She admits that she is “obsessed with light,” which drives her designs more than any other single element. Her firm also offers landscape design, interior and lighting design, and custom furniture and fixtures. She attended the North Carolina School of the Arts, the Julliard School of Music, and NC State University’s College of Design. She lives with her husband, Arnie Schechter, and an assortment of foster animals in a Modern, energy-efficient house she designed. For more information: www.acsarchitect.com.